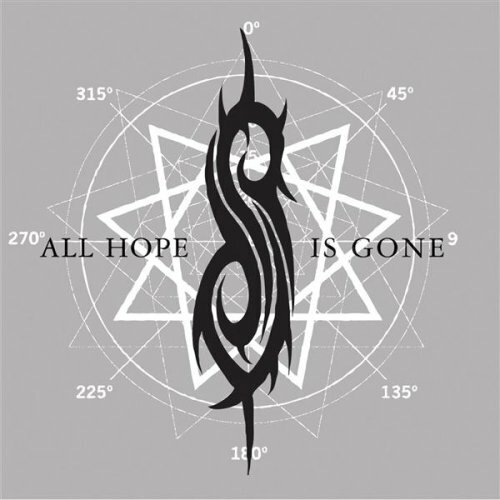 An audio sample of the new SLIPKNOT single "All Hope Is Gone" is available at Amazon.com. The track, which will be released digitally on June 20, comes off the group's long-awaited new album, which is due on August 26 via Roadrunner Records. Other working songtitles set to appear on the CD include "Moth", "Chapter One", "The Eleventh March", "Dirge", "Dead Memories", "Vendetta" and "Psycho Social". A heavier track from the new SLIPKNOT album will be sent to metal radio shows this week, with an official rock radio single coming on June 30. SLIPKNOT frontman Corey Taylor told Billboard.com last month that the group's new album will "rip your face off," adding, "I don't think the world will be ready for this album." The group's yet-to-be-titled fourth effort will follow up 2004's "Vol. 3: (The Subliminal Verses)", with Taylor calling it a "very dark" cross between that and its 2001 sophomore CD, "Iowa". Taylor described the new record as having "so much power in it and yet there are so many great spots for melody...It's a controlled chaos that hits you right out of the gate." Taylor, who also fronts the more melodic STONE SOUR, said that his vocals are in a similar vein on this SLIPKNOT outing. He explained, "I got to the point where I was tired of pretending that I couldn't sing every time I made a SLIPKNOT album, so this time I'm going all out." As for the album's lyrical direction, Taylor revealed, "Instead of bitching about what went wrong in my life, I'm bitching about what's wrong in life, period." New images on SLIPKNOT's official web site have hinted at a change in the masks and costumes that are a trademark of the Iowa-based nine-piece. Taylor described the new outfits as "evolved," adding that they are "very dark and will fit in everything image-wise that we're making with this album." The Rockstar Energy trek, which SLIPKNOT is co-headlining with DISTURBED, kicks off on July 9 in Seattle.